While it isn't snowing here in Iowa, I know there are places that have had their first snows already. Our weather has turned colder so I know it won't be long and we'll be seeing the white stuff flying through the air. In the meantime, here is a happy little snowman who simply loves the snow! Now that I've spent the day making all kinds of cards and goodies in my craft studio, I'm headed to the kitchen to get some soup simmering. With the cooler temperatures, soup will be just the thing to warm me up while I enjoy a movie. 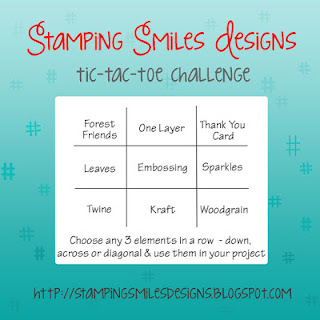 Stamping Smiles Designs has sent out a Design Team Call so, I'm entering my happy little snowman in their Tic-Tac-Toe Challenge. I used the center line down. 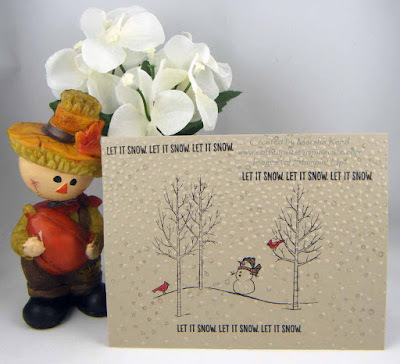 It's a one layer card made from Kraft cardstock (Crumb Cake in my little corner of the world) using the Softly Falling Embossing Folder. Wish me well! Thank you so much for your kind comment. I really enjoyed the Tic-Tac-Toe Challenge. Nicely done. I love the snow effect the most. Thanks, Christine! Snow flurries are in the forecast for me later this week. Sigh... I'm so not ready for any kind of snow.